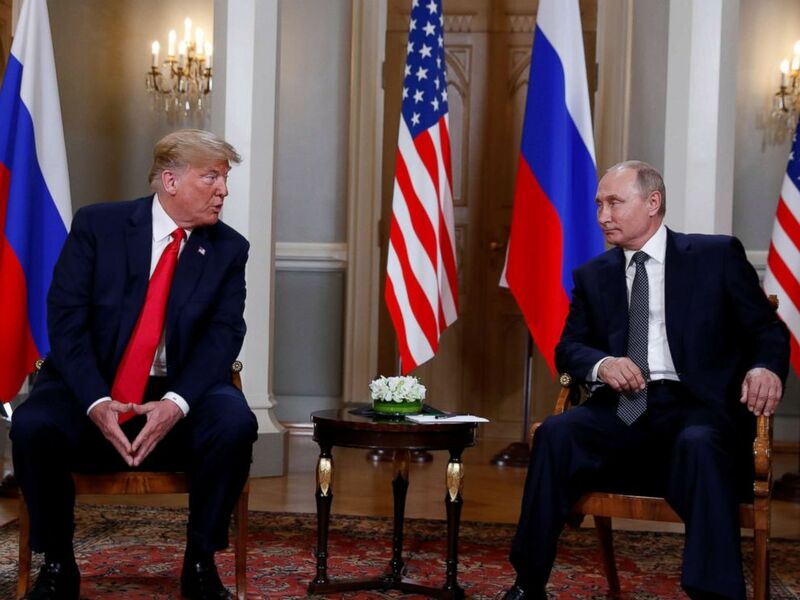 President Donald Trump said he addressed Russia's interference in the U.S. 2016 election and that President Vladimir Putin was "extremely strong" in his denials. "I have president Putin, he just said it's not Russia. I will say this. 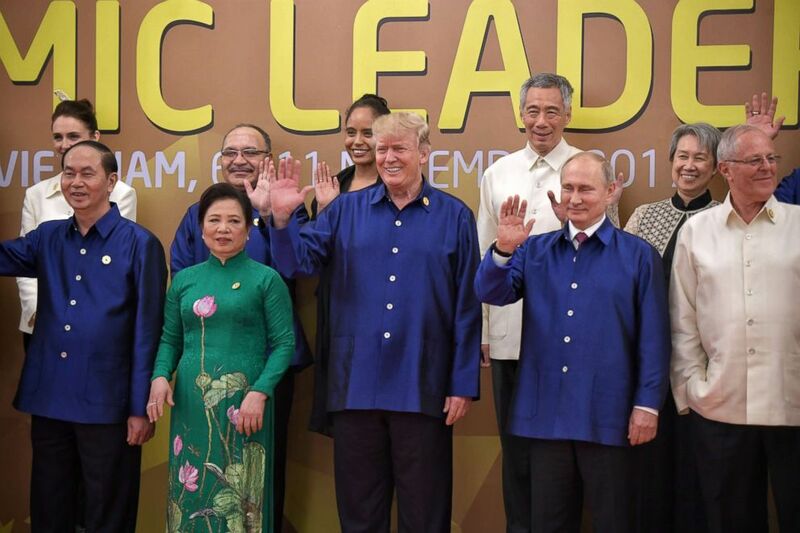 I don't see any reason why it would be," President Trump said, standing at podium side-by-side with the Russian president during a joint press conference Putin in Helsinki, Finland. While Putin has long denied Russian involvement and did so again Monday, the U.S. intelligence community has long maintained that Russia did, in fact, meddle in the U.S. election, and just three days ago, the Justice Department indicted 12 Russian government agents for hacking the Democratic Party during the 2016 election. And following the president's press conference, Director of National Intelligence Dan Coats again reaffirmed that the intelligence community's assessment remains unchanged. "We have been clear in our assessments of Russian meddling in the 2016 election and their ongoing, pervasive efforts to undermine our democracy, and we will continue to provide unvarnished and objective intelligence in support of our national security," Coats said in a statement. While flying aboard Air Force One en route back to Washington, the president tweeted an apparent defense of his comments earlier today by reiterating that he said he has confidence in "MY intelligence people," even as he also cast doubt on the intelligence community's firm conclusion regarding Russian meddling in saying he didn't see any reason to doubt Putin's denials. 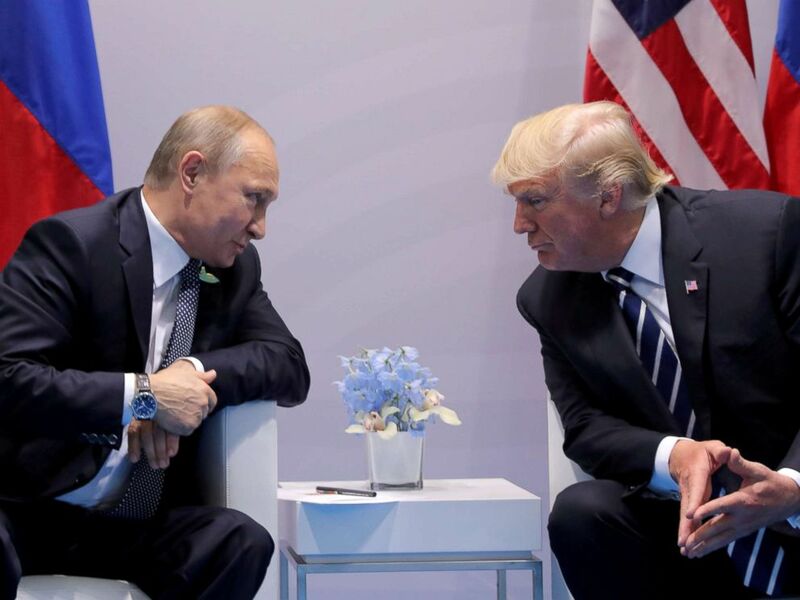 The two leaders met for a long-anticipated summit Monday, but initially publicly made no mention of thorny issues like election meddling, Syria or Crimea before sitting down for the first meeting, a one-on-one encounter. The two leaders began the summit by walking quietly into a room in the Presidential Palace in Helsinki. Against the backdrop of six U.S. and Russian flags, Putin broke the silence with brief remarks. But when Trump spoke, he didn't publicly address some of the issues vexing politicians back home, in Europe and the Middle East, such as the federal indictments last week of Russian military intelligence officers, Russia's defense of Syrian President Bashar al-Assad or the annexation of Crimea. Instead, he started his remarks by congratulating his counterpart on hosting the World Cup. President Donald Trump and Russia's President Vladimir Putin meet in Helsinki, Finland, July 16, 2018. Trump said they'll be talking about trade, military and China. Among the major topics will be repairing the deteriorating relationship between the two countries, he added. "And I really think the world wants to see us get along. We are the two great nuclear powers. It's not a good thing, it’s a bad thing. So we'll be talking about that, among other things." 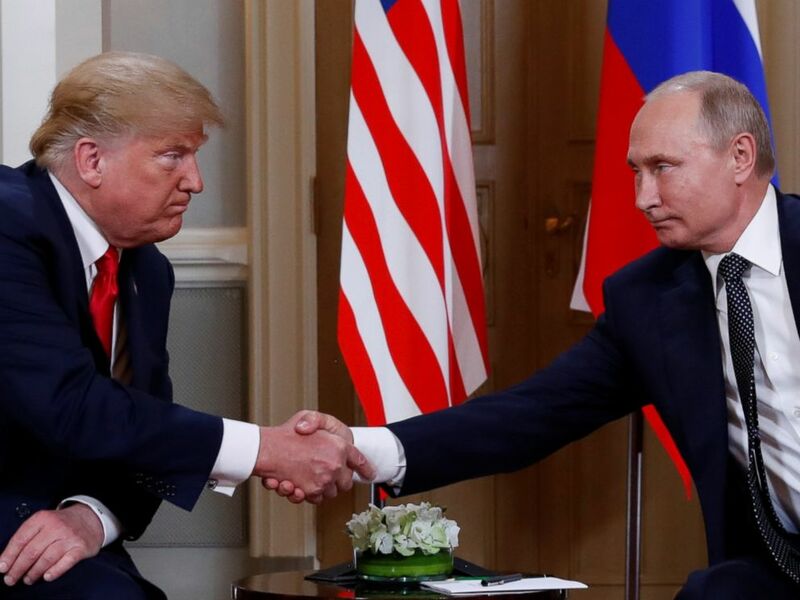 President Donald Trump and Russia's President Vladimir Putin shake hands as they meet in Helsinki, Finland, July 16, 2018. Putin, who is known to keep world leaders waiting, arrived almost 30 minutes late in Helsinki for the meeting. In his opening remarks, he said the time had come for bilateral relations in "various hotspots in the world." "I am glad to meet with you on the hospitable soil of Finland," Putin told Trump. He didn't address some of the more controversial issues, either. The pool of reporters shouted several questions about election meddling to Trump after his remarks but he didn't respond. The leaders then ducked into a private room to start the bilateral meeting with advisers and interpreters. After two hours of meeting privately, Trump and Putin emerged and then headed to the expanded bilateral meeting and working lunch. 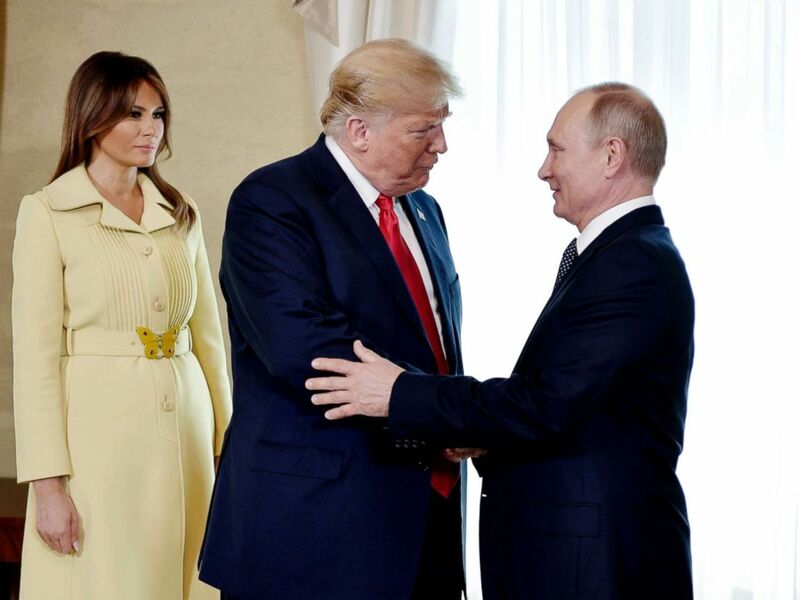 First lady Melania Trump, left, President Donald Trump and Russian President Vladimir Putin welcome each other at the Presidential Palace in Helsinki, Finland, July 16, 2018, prior to Trump's and Putin's one-on-one meeting in the Finnish capital. Trump told reporters the private part of the summit had gone well. "I think it's a good start, a very good start for everybody," he said. Trump and Putin will hold a news conference after the lunch. The meeting happened after a week of worldwide anxious anticipation spanning from the United States to Europe to Russia. 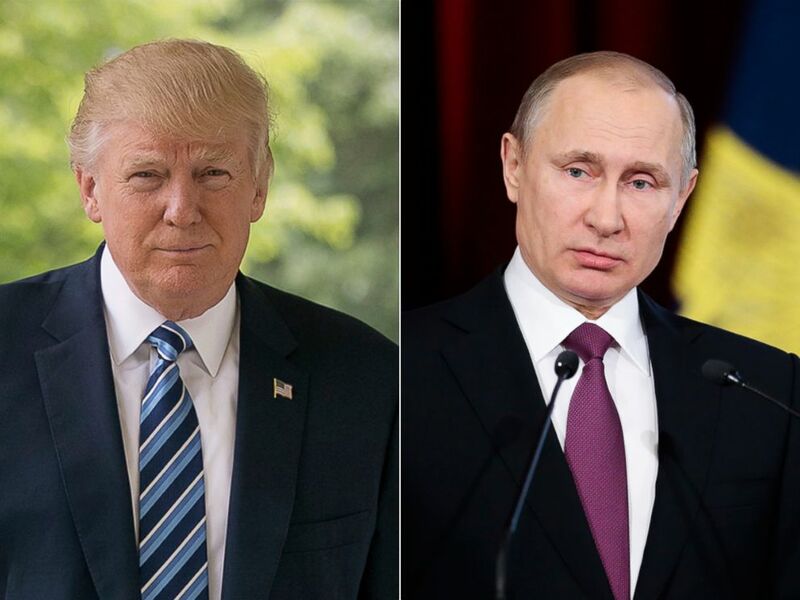 Before they met, Trump tweeted, "Our relationship with Russia has NEVER been worse thanks to many years of U.S. foolishness and stupidity and now, the Rigged Witch Hunt!" 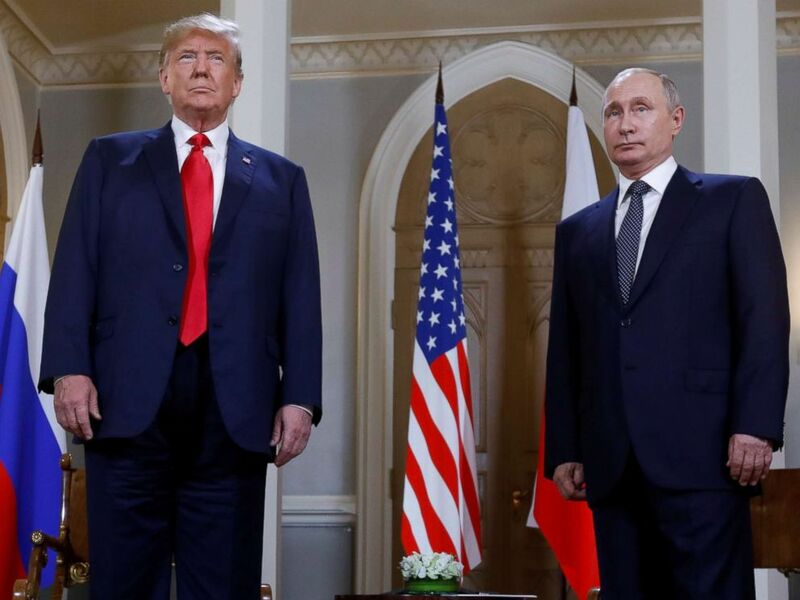 Trump has said he hopes to improve relations with Russia but has placed blame for the deteriorated relationship on his predecessor, President Barack Obama, rather than Russian aggression and meddling. The Russian ministry of foreign affairs tweeted Monday: "We agree." When asked about his message to Putin during a breakfast at Mantyniemi, the Finnish president's residence, with Finnish President Sauli Niinisto and first lady Jenni Haukio, Trump simply replied, "We'll do just fine, thank you." 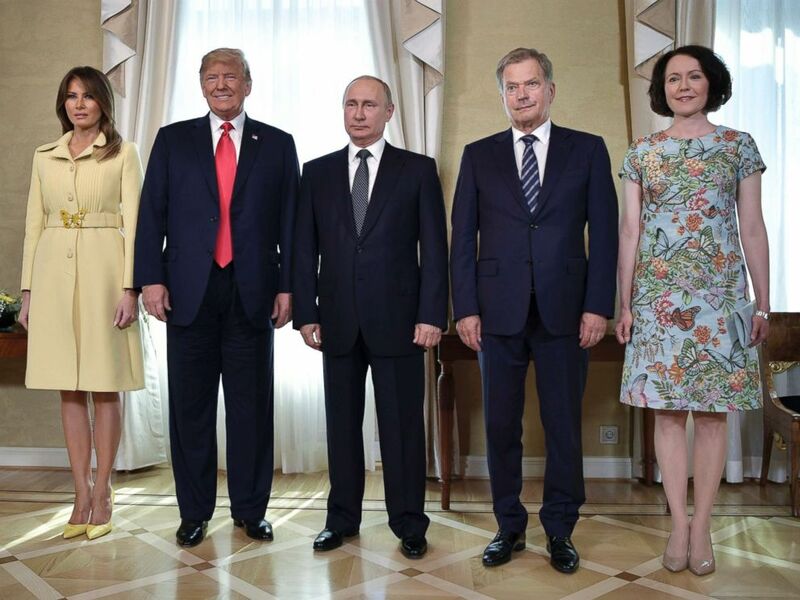 PHOTO:First lady Melania Trump, President Donald Trump, Russian President Vladimir Putin, Finnish President Sauli Niinisto and his wife Jenni Haukio at the Presidential Palace in Helsinki, Finland, July 16, 2018 in the Finnish capital. The stakes are high for the summit. Just days before Trump arrived in Helsinki, special counsel Robert Mueller issued indictments on 12 Russian spies for their alleged interference in the 2016 election. At NATO, allied leaders condemned Russian aggression in Eastern Europe, and British Prime Minister Theresa May said at a news conference with Trump that she welcomed "the strong response from the U.S. on the poisonings in Salisbury." Trump said election interference, along with Syria, Russia’s illegal annexation of Crimea and meddling will be among the topics on the table Monday. “I know you’ll ask will we be talking about meddling. And I will absolutely bring that up. I don’t think you’ll have any, 'Gee, I did it. I did it. You got me.' There won't be a Perry Mason here, I don’t think. But you never know what happens, right? But I will absolutely firmly ask the question," Trump said at Chequers, May's residence, Friday. President Donald Trump walks along the West Wing Colonnade at the White House in Washington, April 21, 2017 | Russian President Vladimir Putin speaks at an annual meeting in the Interior Ministry in Moscow, March 9, 2017. It was still unclear if the issues came up during the private meeting. Kremlin press secretary Dmitri Peskov told reporters before the summit that if Trump brings up interference in the U.S. election, he will "reiterate that Russia did not and could not bear any relation to the matter on which such speculations are centered." 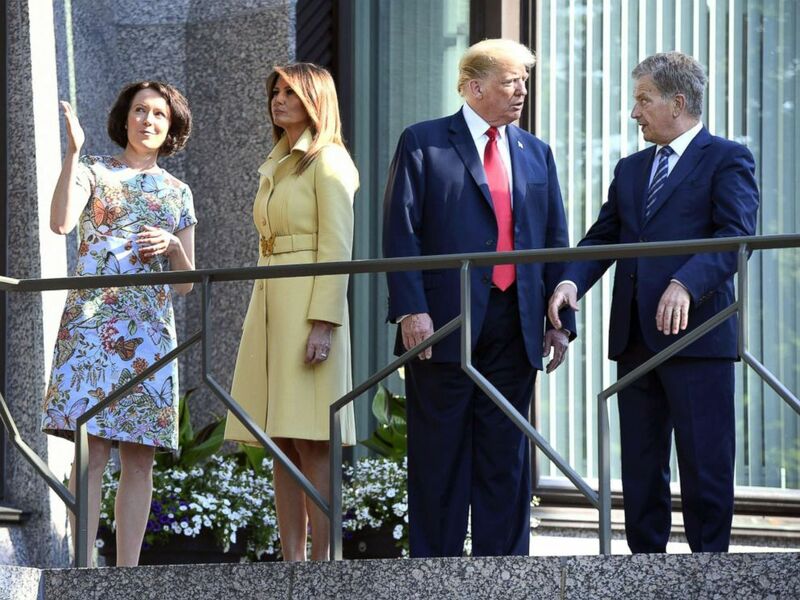 President Donald Trump talks with the President of Finland Sauli Niinisto (right), as first lady Melania Trump talks with his spouse Jenni Haukio, left, at the president's official residence in Mantyniemi, in Helsinki, Finland, July 16, 2018. 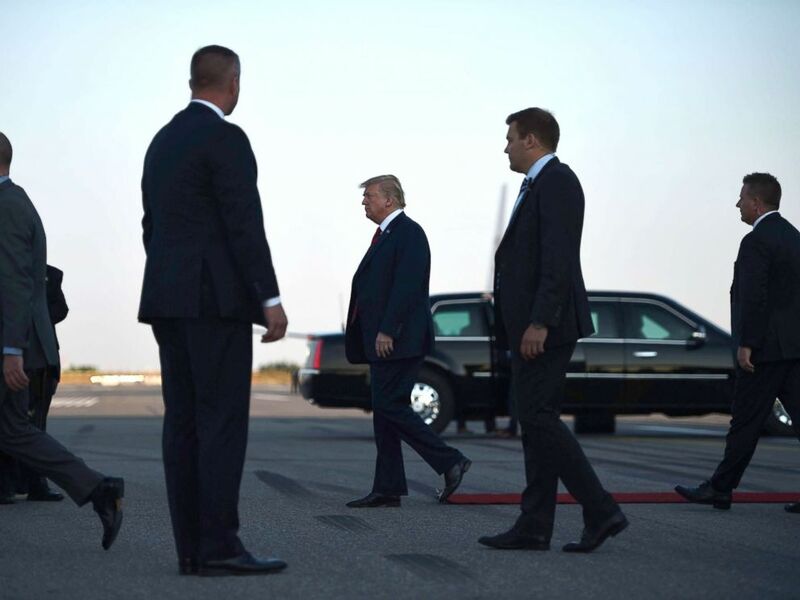 US President Donald Trump walks towards the Presidential car upon arrival at Helsinki-Vantaa Airport in Helsinki, July 15, 2018, on the eve of a summit in Helsinki between the US President and his Russian counterpart. 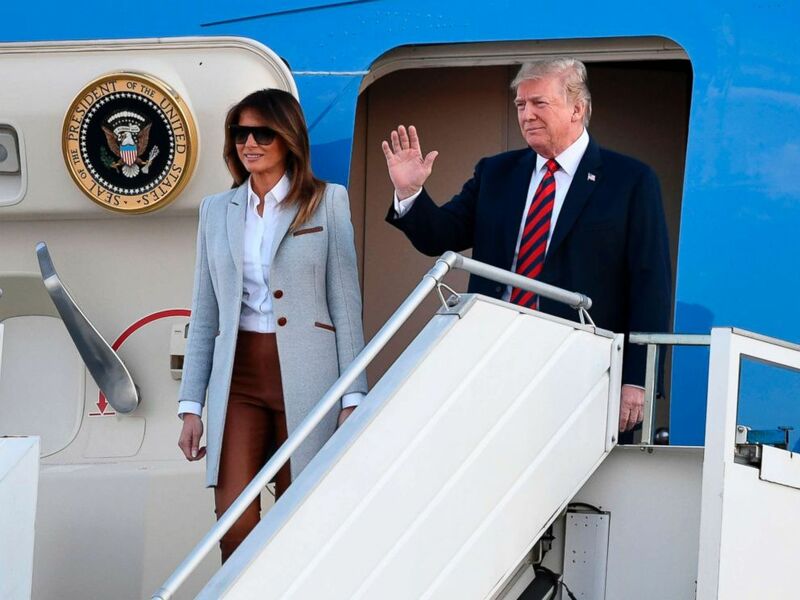 President Donald Trump and First Lady Melania Trump disembark from Air Force One upon arrival at Helsinki-Vantaa Airport in Helsinki, July 15, 2018, on the eve of a summit in Helsinki between the US President and his Russian counterpart. "We have asked and the Russians have agreed that it will be basically unstructured. We're not looking for concrete deliverables here," Bolton said Sunday on ABC News’ "This Week." "I think it's very important that the president has a direct one-on-one conversation with President Putin. That's how this is going to start." While allied NATO leaders like May were encouraged by Trump’s meeting with Putin, lawmakers at home expressed skepticism before the talks in Finland and even told Trump to cancel their meeting if he could not guarantee a hardline response to election meddling. FILE Russia's President Vladimir Putin talks to U.S. President Donald Trump during their bilateral meeting at the G20 summit in Hamburg, Germany, July 7, 2017. 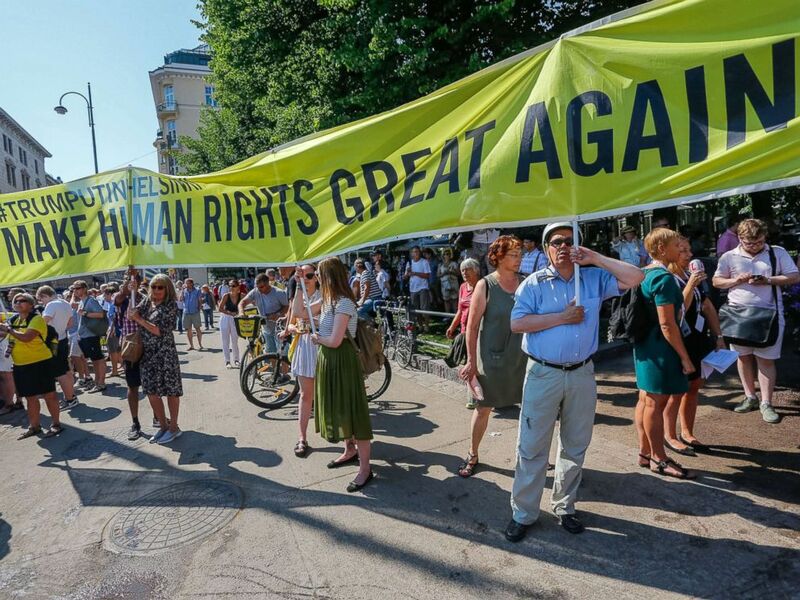 People take part in a demonstration calling for human rights and democracy in Helsinki, Finland, July 16, 2018, on the day of the summit between President Donald Trump and Russian President Vladimir Putin. 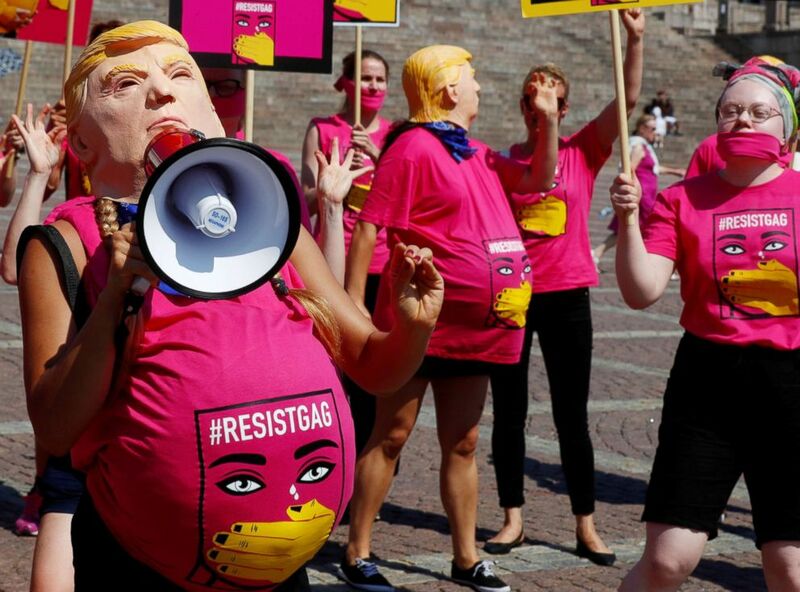 Protesters demonstrate against President Donald Trump at Senate Square at the Putin summit in Helsinki, Finland, July 16, 2018.